It's been nearly two months since we started decorating the boys' bedroom. We sometimes move slowly around here, but there is forward progress nonetheless! As you may recall, we scratched the original closet to give it a more functional layout for my two boys to share. 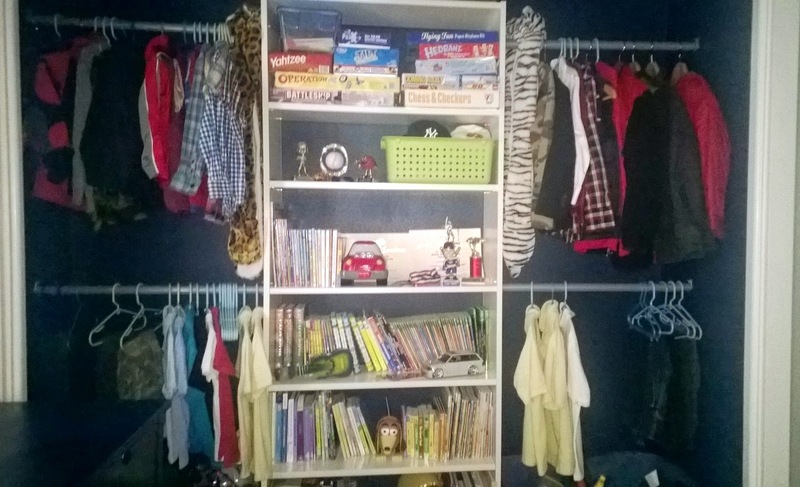 Once we removed the two bulky mismatched dressers from the closet (as well as the single rod and shelf that spanned the width of the closet), we were able to redo the layout and designate different "areas" for each boy. It functions so much better now. 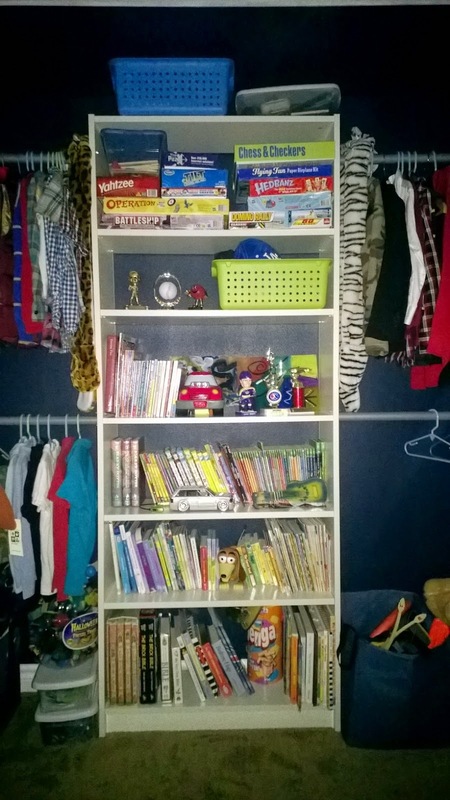 In addition to holding the kids' hanging garments, the closet now houses their books and games. The closet will probably undergo another makeover as the boys grow, but for now, it functions perfectly at this stage! 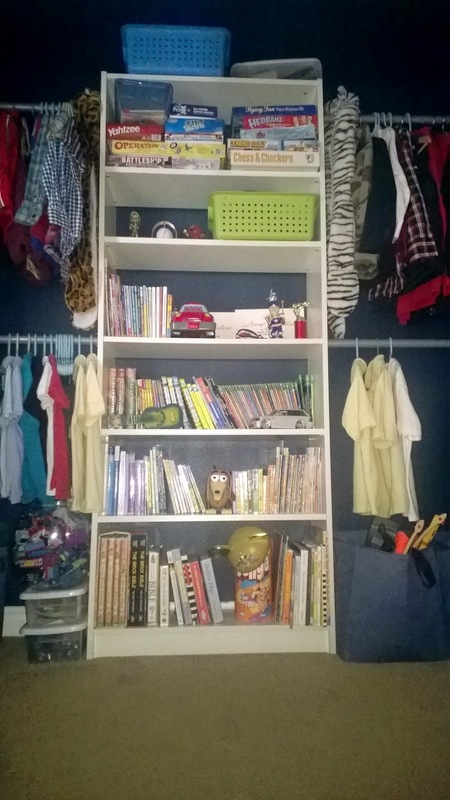 To maximize floor space in the boys' shared bedroom, a tall vertical shelving unit was installed in the closet for more storage. We previously had a small bookcase in the room that took up valuable space. The shelving unit also delineates each boy's side of the closet, which is filled with double sets of rods for their hanging clothes. Another major change in the closet was painting the interior a navy blue. It made the closet "pop", which was intentional to introduce a new color to their room (which is painted soft gray). We didn't bother to replace the missing closet door when we purchased the house, so the bold color provided some design impact. We considered installing a sliding "barn" door, but because of the beam in the room, we opted to leave the closet uncovered. 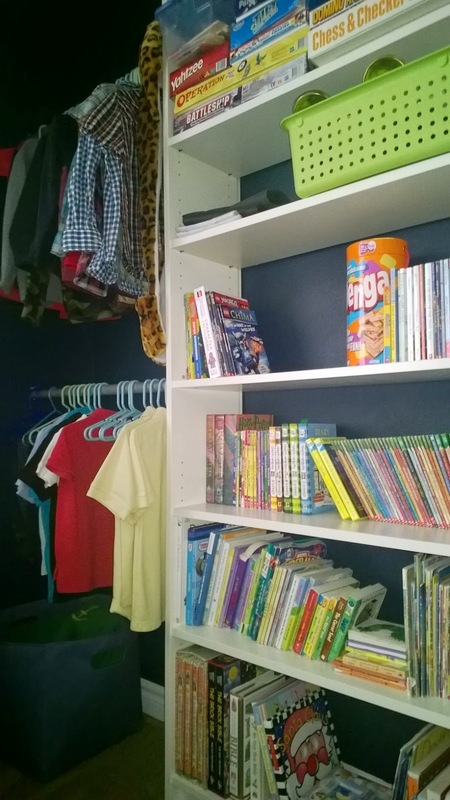 This closet makeover cost ~$100.00 for all materials, with the majority of the cost going towards the shelving unit. Not too bad considering how much it would cost to have a professional closet system installed!